Welcome to the world of being a Suzuki parent! To some of you, this experience may be a new one, and to others, this may be routine. The Suzuki method provides a unique and natural way of learning to become a musician. In order to more fully understand the Suzuki method, I recommend the book Nurtured by Love by Dr. Shinichi Suzuki, and the class for teachers and parents titled Every Child Can – a course on the idea that every child can learn a musical instrument just as he learns his native language. If you are interested, please see me for more details on both of the above. At the very beginning – with the first lesson, the first teacher and the first pieces (Twinkle, Twinkle, Little Star), we have the very important task of helping to develop the child’s habits, which will carry through to other disciplines and throughout his life. To study piano, it is necessary to supply your child with the best instruments for study in order to expect the best out of your child. These first essentials are: a positive attitude from the parent and the teacher, a good piano (the best instrument within the means of the family), an adjustable bench, a footstool, a quiet environment free of distractions such as television and video games, respect of the family for the child’s experiences with music, and high expectations. Being positive does not mean being happy with mediocrity. Every lesson begins with the first steps – making them better each time; every lesson builds from the foundation and mistakes are a part of the process. So, whether your child is working on her ready position, or preparing for a Book completion recital, that foundation – good tone, patience, etc. will be addressed at every lesson. For each piano lesson, it is expected that the student bring, in a suitable bag, all music books currently being used, the student’s assignment notebook, and a pencil. At home, the student should be able to access a good piano with a comfortable bench, a metronome, a tape or CD player and a pair of nail clippers. Siblings are welcome to observe lessons. However, in the group lesson setting, if a sibling is being disruptive, please feel free to take a break together outside the room so that class may continue. As pianists, we all must share the same instrument – so please get your child in the habit of washing his hands before and after lesson. The group class is essential to Suzuki study. It helps students enjoy musical interaction in a social environment, which is especially important for the pianist. It offers an opportunity to reaffirm skills presented in private lessons, to keep review pieces fresh, to look ahead to future musical experiences, to learn from each other, and instills comfort with playing in front of an audience. Regular attendance is mandatory not just for your own child’s benefit, but for the courtesy and benefit of the whole group class. Please notify the school and your teacher if you must be absent. Your commitment is a consideration especially for those fortunate enough to receive scholarship. Group lessons are carefully structured to give your child the best environment for learning. Children are placed in groups based on their ages and skills. Groups advance with the students, so you can expect your child to become comfortable in this music community. Please be on time for group class as a sign of respect to the teacher, the other parents, and the other students. Parent participation is a large part of the Suzuki program of study. Diligent note-taking is important as parents will learn how to practice with their children and essentially be their child’s teacher at home during the week. Listening to music is also vital at this stage of music study. Please try to attend live musical events in your area. The schools post bulletins of current and future concerts you and your child may be interested in attending. Students need to be listening to the repertoire daily. (Suzuki Volume 1) (Suzuki Volume 2) It is not necessary to sit down and focus on the music – merely to have it playing in the background. (The Suzuki method is based on the mother-tongue approach to music learning.) Remember – adults live in the world of reason; children live in the world of the senses. Parents must try to be positive and consistent. Let your child play at the piano! 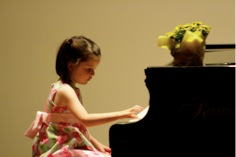 While it is important to go through everything that occurred at the lesson daily during practice, it is also important to let your child experience what THEY can learn on their own at the piano. Please let them play. Regarding practice – setting aside and sticking to a practice time is your responsibility. Just as you decide to serve your child three well-balanced meals and take the initiative to get them to brush their teeth every day, you are responsible for giving that loving and firm push to create a healthy practice ritual and musical environment for your child. Being a musician is a habit and needs to become a part of one’s daily routine. As Shinichi Suzuki once said, "Practice on the days you eat!" Regular routine practice is far preferable to lengthy, but inconsistent practice. Practice sessions should occur in a quiet environment ideal for focus (no TV) and at a tuned piano. Pianos should be tuned every six to twelve months. Regular, focused and supervised (depending on the age of the student) practice will result in more rewarding lessons and a greater musical experience. Probably the best and most effective time to practice will be the evening after your child’s lesson. At this time, everything covered in the lesson will solidify in both their fingers and in yours! You can expect your child to find a very supportive environment of teachers, parents and children who are all excited about studying music. In group class, you can expect to encounter a variety of the following activities each week: Warm-ups, Listening Exercises, Ear Training, Repertoire Review, new material, ensemble work, musicianship, developing stage presence, music reading and theory. 1. We are nurturing a child to develop a skill they are already excited to acquire. 2. We are guiding a child to use beautiful technique to create music from the very beginning. 3. We are emphasizing parental involvement and encouraging closeness. 4. We are developing a child’s skills at the piano using music they already know. 5. We are able to apply this nurturing philosophy elsewhere – besides music. 6. Small steps are viewed as great achievements. 7. Students develop balance, confidence, discipline, respect, great listening skills, and a better memory. A big part of Suzuki studies is regular performance. Students are invited to prepare Suzuki Book Graduation Recitals (see a collection of those who have done so here) and in preparing to perform an entire book, you may keep the following guidelines in mind as a goal for your child: SAA Performance Descriptors. As always, if you have any questions, please feel free to contact me before your child’s lesson or by phone or e-mail. If we work together, we can make this a very positive and important experience for your child. You may also find it helpful to read the introductory page that the Suzuki Association has, which includes a very good seven minute video here! For more monthly information, see my teaching blog. For Suzuki Parent Community Support join the Facebook Group! Happy practicing!